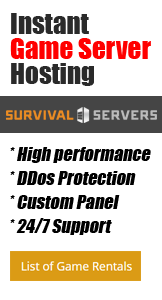 Here you will find links to the specific sections for Modify Server Config tools for different game servers. If you have additional questions or need help, please submit a support ticket and we will help you as quickly as possible! If you're having trouble finding your modify server config tool, it can be located in the control panel, typically on the right side under the server name, password and admin passwords and is highlighted by a bright yellow color. Withing this option you'll find various ways to modify and customize your server to make it your very own! In order to save your "Modify Server Config" changes that you made, it is extremely important to scroll to the bottom of the page and click on the Save Configuration button. A very common mistake is to make the changes and then click on the 'x' to close the window. This will NOT save your settings. This is the pop-up window that will appear when you click on the "Modify Server Config" button on your control panel. The "PvP Enabled" checkbox determines whether or not players will be able to damage other players on the server. If this box is not checked, players will be unable to harm other players on the server. The "PvP Blitz Server" checkbox will need the be checked in order to create a blitz mode server on Conan. The "Can Damage Player Owned Structures" checkbox will allow players to damage one another structures, regardless of if PvP is on or not. Though not all of the multipliers for the Conan server are shown in this picture, there are dozens of different variables that can be accessed and modified to your liking. Every multiplier in the Conan config has a description below it. They multipliers range from damage to respawn to harvesting etc. ensuring that you can create your world the way you want it to be! The "Max Aggro Range" multiplier is going to determine the distance at which an enemy will detect and start to attack you from. Annoyed of Hyenas and NPCs attacking you while you're trying to farm resources? You can turn this slider down to adjust NPCs detection of you. BattlEye is an anti-cheat protection service that comes with Conan. You can enable or disable it to allow cheats inside the game. Please note, this does not limit cheating to you, but to everyone on the server possibly if not protected. This page was last modified on 20 May 2018, at 05:53.